I’ve been waiting for the right inspiration to kickstart my blog again. I got it on Monday at the 2016 #GoldenRadish ceremony in the Georgia State Capitol. I was beyond honored to speak briefly about the 53 districts, representing over 39 million school meals featuring both regional and local Georgia Grown products, 8246 farm to school taste tests, 575 school gardens and so much more. The number of #GoldenRadish awards have expanded dramatically since the original 30 in 2014. The #GoldenRadish committee keeps adding new categories – Outstanding District award in 2015 and a planned 2017 Platinum award – challenging districts to grow better and better farm to school programs. At Statham Elementary School, a site in the Gold Level #GoldenRadish Barrow County School Nutrition District, Diana Cole and her special needs students have explored #LeafItToSpinach as part of their October #FarmToSchool Month lessons. As I entered the classroom Tuesday, they were reading Sylvia’s Spinach before tasting Spinach Lasagna, enjoying the Spinach Brownies they had made themselves, and going out to check on their newly planted spinach seeds in the school garden. After the garden we all enjoyed Georgia Grown Spinach Salad (and carrots too) for school lunch. While award ceremonies feature state officials and fancy plaques, the real work of changing how Georgia’s children eat is moving forward with #onesmallstep at a time in classrooms like Diana’s Cole’s every school day. I’ve been following Bibb County Schools – aka Eat Right, Be Bright – for years. Director Cleta Long does an outstanding job and folks know it: SIXTEEN Bibb County Schools were recognized this year among America’s #HealthiestSchools by the Alliance for a Healthier Generation. Cleta and her staff take their Gold Level #GoldenRadish status seriously with boxes and boxes of local produce served all year round in deliciously appealing ways. Bibb County’s healthy ways extend beyond the cafeteria to Georgia Grown parades for #FeedMySchool week in hallways, nutrition education in classrooms, science-lessons in school gardens, and real field trips to local farms. In addition to 16 #HealthiestSchools awards, Bibb County was recognized with two Georgia School Nutrition Association #BestPractice awards and ten Let’s Move Active Schools. #HarvestBright is the new tagline for Burke County Public Schools Farm to School Program, the Outstanding District honored at Georgia Organics 2016 #GoldenRadish ceremony. Director Donna Martin, President-Elect of the Academy of Nutrition and Dietetics, was recently described as the “Ultimate Lunch Lady.” Donna actively promotes the benefits of #FarmToSchool and #SchoolMealsThatRock from the fields of Burke County to the White House Garden. Donna travels the world to promote Registered Dietitian Nutritionists and the Academy, but she is still happiest eating lunch with Burke County Public School students, out standing in collard fields with organic farmer Sam Adderson, or planning new ways to get even more local products, like grits, onto school lunch trays and farmers market shopping bags. Barrow, Bibb and Burke counties were just three of the award-winning districts celebrated on the steps of Georgia Capitol on October 24, 2016. There are 50 more districts with dedicated directors from the Atlantic coast to the mountains of north Georgia. How has Georgia Organics been able to successfully grow the #GoldenRadish Awards for all these Georgia districts doing such extraordinary work in farm to school? It’s really pretty simple: Georgia Organics coordinates the #GoldenRadish Awards with the Georgia Department of Education, Georgia Department of Agriculture, and Georgia Department of Public Health, a powerful team to make the dream of local food for local kids work. It’s really no wonder that, according to USDA’s 2015 Farm to School Census, 62 percent of Georgia districts participate in farm to school programs – well above the 42 percent of districts nationwide. For more about all the current award winners and next year’s applications, please visit the Georgia Organics website at https://georgiaorganics.org/for-schools/goldenradish and blog at https://georgiaorganics.org/2016/10/53-georgia-school-districts-honored-farm-school-success/. A version of this article originally appeared on The Huffington Post Green on October 14, 2013. The real food deliciousness of Farm to School efforts benefits everyone: The farmers and ranchers who grow food for local districts, school nutrition directors who know exactly where their food comes from, and – most of all – millions of students who enjoy fresh food right on their school trays. The three pillars of a sustainable farm to school program are generally seen as Cafeteria, Classroom and Community. But there is fourth, equally important C – Champions! Successful farm to school programs are started, nurtured and harvested by champions at every step from the field to table. Here’s how three directors – three very cool school lunch dudes – from Maine to Montana are growing impressive farm to school numbers. Thanks to Nutrition Services director Tyler Goodwin, students in the Wells-Ogunquit Community School District on the coast of southern Maine have a personal relationship produce on their lunch trays. It comes from the Spiller Farm, just two miles down the road and students help to pick it, clean it and prepare it. 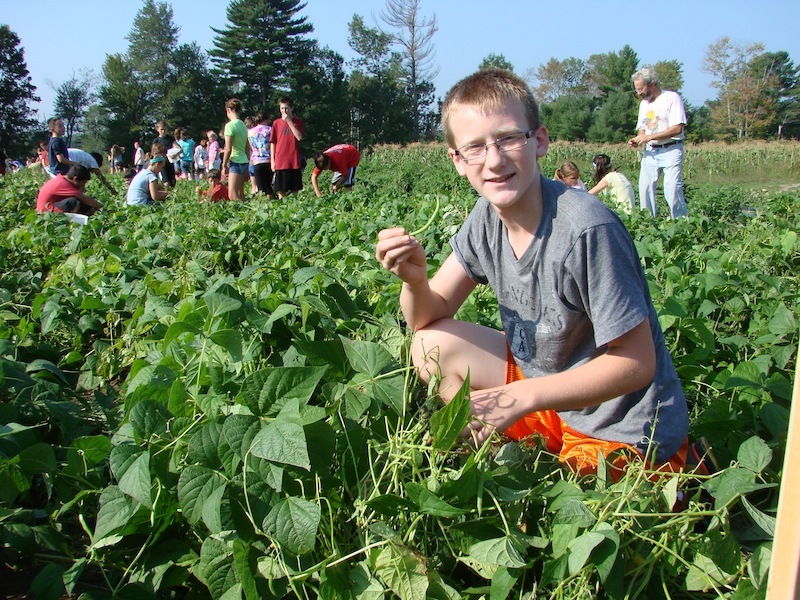 During September 2013 trips to the farm, hundreds of school kids picked 15 bushels (450 pounds) of green beans, 18 bushels (900 pounds) of red potatoes and 15 bushels (720 pounds) of apples (enough to supply the entire District for the next several months). In fall 2013, Chef Tyler froze 10 bushels of carrots, also picked by student helpers. The final yield was 450 pounds of freshly picked, lightly steamed, very local frozen carrots for winter meals like veggie stir-fry, peas-n-carrots and candied carrots. Total time from field to freezer was less than four days, with a substantial decrease in overall carbon footprint. The environmental impact is important to the district’s Green Team, headed by 7th grade science teacher Saul Lindauer. The team is learning about and working to support centuries of farming heritage in Wells. According to Goodwin, fresh local produce makes a real difference in cafeterias too. “What I have noticed in all schools is healthier choices being made, kids are automatically selecting the required fruit or vegetable with lunch, and less waste than last year,” he reports. Deep in the apple orchards of Central Michigan, Dan Gorman, Food Service Director in Montague/Whitehall Schools focused on some big farm to school numbers too – world record numbers in this case! On October 24, 2013, he and the districts’ 4,000 students – plus at least 14,000 more in Muskegon County – regained the World Record for the “most people simultaneously eating an apple at one time.” Muskegon County held the world record (9,329) until last May when children in New Zealand schools upped it to 17,064 with the help of an apple company. Now the Michigan apple crunchers are back on top of the world record with 19,087!! 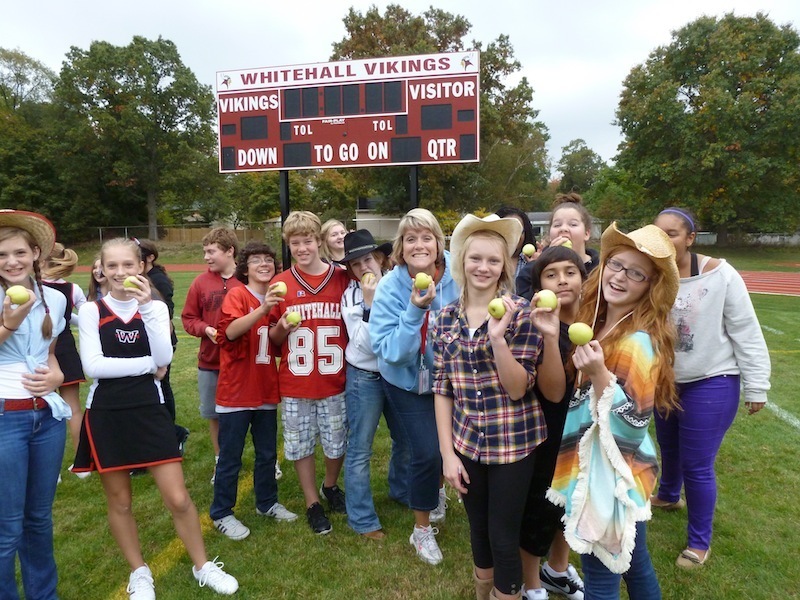 Whitehall, Michigan, students love their apples!! Promoting healthy snacking, supporting local agriculture and generating record-breaking excitement are just some of Dan’s everyday efforts to bring fresh, local food to kids. When he switched the district’s milk contract to a local dairy that raises its own cows and crops, the farm was able to hire four new workers. In the elementary cafeterias, monthly Harvest Days highlight Michigan fruits, vegetables and herbs. Students get to touch, smell and taste fresh items with their lunch, guided by an adult community member or high school mentor. As chair of the 1 in 21 Education Committee, Gorman is – as always – focused on a much bigger goal. “Going for a world record is as American as apple pie, but the more important goal is making Muskegon county the healthiest county in Michigan by 2021,” he says. Now, about the kale chips for 8,000: It happened for the second time on October 2, 2013, to celebrate National Kale Day in Missoula County Public Schools, Montana. 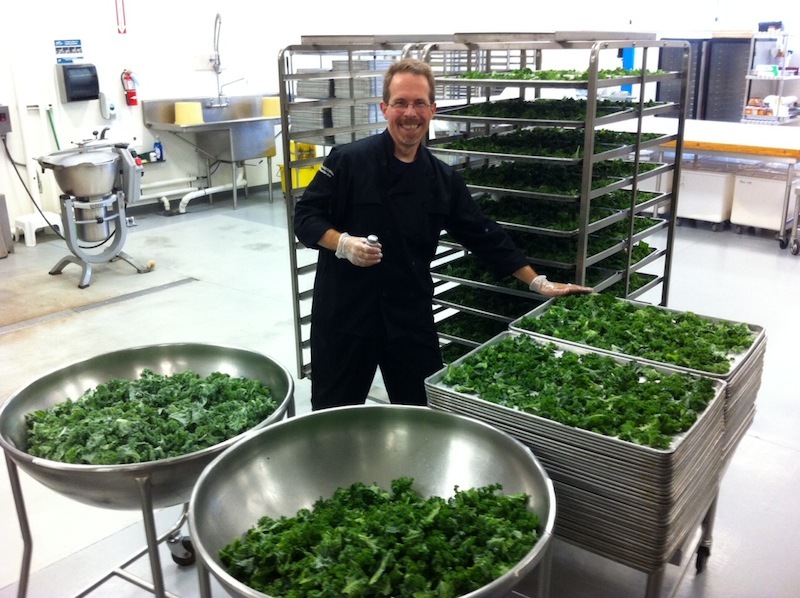 In 2012, on a ‘dare’ from Jason Mandela of the PEAS (Program in Ecological Agriculture and Society) Farm, Food and Nutrition Supervisor Ed Christensen offered baked kale chips to every student in the district. While not shy about saying his kale chips are “the best,” Ed was impressed by how much the kids liked them. “It’s really pretty simple,” he says. “We use freshly picked kale, toss it with oil, sprinkle with a little salt, and bake slowly.” While olive oil adds nutty flavor and USDA commodity oil works fine, Christensen also likes to use Montana-grown safflower on his kale chips. Kale is big on Christensen’s local veggie list because it’s so hardy, often the last thing harvested from the PEAS Farm. Chips are a great way to serve kale because they are like potato chips to kids. On a recent ‘smack down’ with a tasty raw kale salad, the crunchy chips won hands down. During this year’s Kale-abration, Ed saw savvy 3rd graders crushing the chips onto their pizza. About that pizza, the crust is 100 percent scratch, whole grain made with local Wheat Montana Prairie Gold flour and turkey pepperoni. Missoula schools are currently developing a scratch sauce to incorporate house-grown onions and herbs. Clearly Ed wants to do farm to school as many ways as possible – in a place with a growing season of about four months!! Being a school nutrition director is a tough enough job without adding all the extra details of a farm to school program. Despite the demands, thousands of directors across the U.S. have stepped up to the plate — or lunch tray — to do what Tyler, Dan and Ed do in their districts. Why? So students can have the freshest, best tasting, most nutritious meals possible and be fit, well-nourished and ready to succeed.